Downtown Orlando - the centre of Orlando is your typical thoughts of an American city, made up of tall office blocks with the main tourist areas located to the south of the city. International Drive (I Drive) - this is the place to stay if you want to feel right in the middle of the everything but I am not quite as keen on staying here. 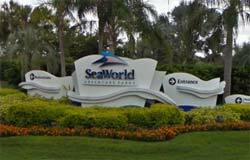 With Seaworld, Wet'n'Wild and Universal Studios close by its easy to see why so many people make this their starting point. Belz's Factory Outlet and the famous Florida Mall are also close by. The Walt Disney World Resort is between 7 and 11 miles away - a short drive along Interstate 4 (I4). Kissimmee - is a bit more spread out than International Drive (I Drive) and the big advantage is that you are closer to Disney. There are still numerous restaurants, shops galore including the The Loop shopping mall and various entertainment such as Kissimmee Old Town and Boggy Creek Airboat Rides. Lake Buena Vista - On the doorstep of the Walt Disney World Resort, this area is close to all the main attractions and there is plenty of nightlife and entertainment in nearby Downtown Disney. Shop at the Disney Village Marketplace or head to Pleasure Island, an entire island dedicated to fun and entertainment including Planet Hollywood. Walt Disney World Resort - Covering an unbelievable 39 square miles (the size of Coventry), the Walt Disney World Resort includes all the Disney attractions you have heard about.